Most other preparation can be done while the aubergines cook in Stage 1. Aubergine Boats are particularly nice served with our special cous cous or quinoa recipes - or a creamy potato salad. You could also stick some whole cooked lentils in the sauce for extra oomph, play around with different herbs or spices, add a dash of red wine, top with some grated vegan cheese like Violife... oh, there are lots of possibilities! And if you want something different from tomato sauce, check our Sauce section for inspiration. Find budget aubergines in places like Aldi, Lidl or a good local greengrocer to make this a cheaper dish. 1. Bring a large pan of water to the boil and place both whole aubergines in it. Cover and simmer for 10 minutes. Preheat oven to 350ºF/180ºC/Gas Mark 4. Prep everything else so you're ready to go. 2. Drain the aubergines, chop off the stem ends, slice them in half lengthways and allow to cool. Scoop out the aubergine flesh - but leave enough around the sides so that they don’t collapse. 3. Chop the flesh, and fry in oil with the onion for about 5 minutes until the aubergine is browned. 5. Remove from heat, add the bouquet garni, salt and pepper, and mix well. Place the aubergine skins on a greased baking tray and fill them with the mixture. Place in the centre of oven for 15 minutes. 6. Meanwhile make the tomato sauce. Gently fry the garlic and onion in the oil for a few minutes. Add the remaining sauce ingredients and warm gently on lowest heat. 7. 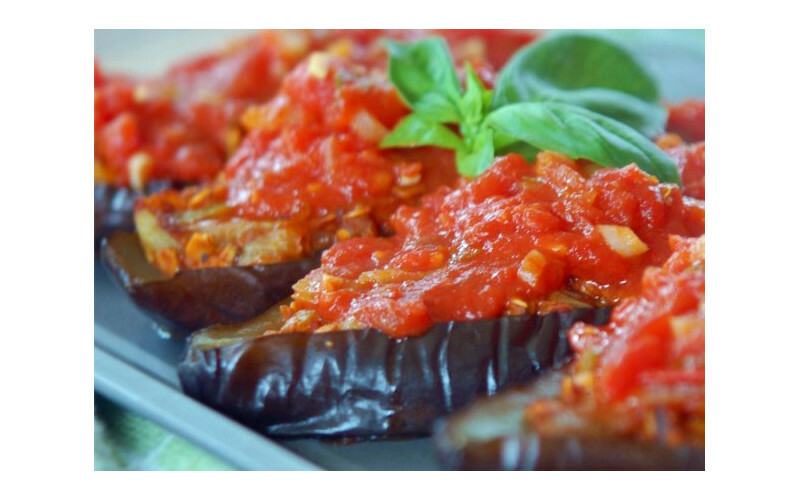 Remove the aubergines from the oven and serve topped with tomato sauce.